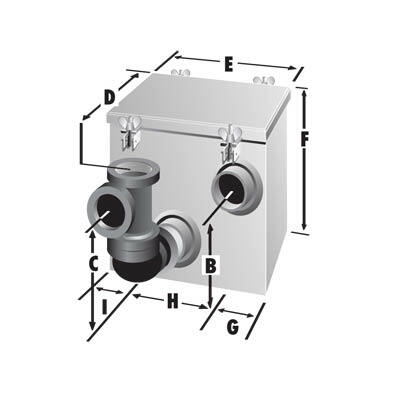 Furnish ______Rockford Model G-______-C all-welded steel separators for inside cabinet installation, 4 g.p.m. intermittent flow, 1-1/2" tapped inlet and outlet, 6lb. greasy sludge capacity, visible double-wall outside trap seal, easily removable separator screen and filter screen, gasketed cover hand-tightened to body with safety-catch bolt assemblies, enamel coating inside and outside. Epoxy coated. All stainless steel. These are designed to fit into the small space of complete kitchen units, including compact sink-range-refrigerator combinations.